A long, long time ago, I played one of the very first Massively Multiplayer games. It was actually a set of games, really – dubbed the ImagiNation Network and owned by Sierra, it had several different sub-sections including standard board and gambling games, a multiplayer Red Baron, and, most importantly, an RPG called Shadows of Yserbius (later, Fates of Twinion and Ruins of Cawdor would be added). At the time, the MMO had to be a part of basically its own internet, since the World Wide Web wasn’t really much of a thing at that point, and so service was extremely expensive especially by today’s standards. Unfortunately, it seems to have also been too expensive for the owners, since they ended up being shut down. 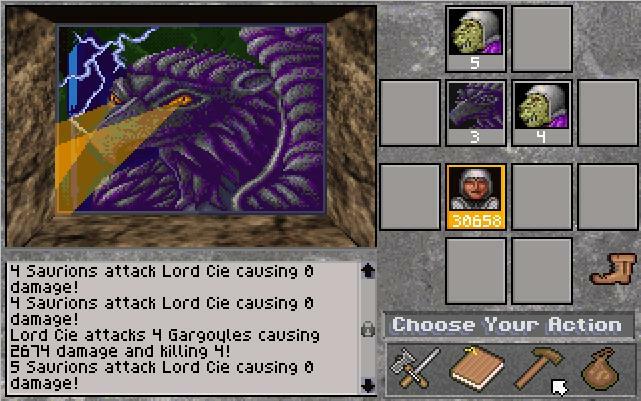 It’s fascinating that the decision to kill Yserbius and its cousins was made to avoid competition with (the MMO) Neverwinter Nights, as that’s another such game I have some memories of. In any case, it’s possible to download a version of Shadows of Yserbius and play it on your own, but that only gets you maybe a quarter of the experience. Yserbius was meant to be played online, and its balance for single-player is really pretty bad. We’ll set aside whether it’s actually a good game. Where does this leave us? Some hobbyists are trying to resurrect INN in some form, but haven’t really gotten much of anywhere. If they did, it would be perhaps a fraction of the original subscribers — of which there weren’t all that many in the first place. It couldn’t possibly be the same, only somewhat similar. There is an experience here that is arguably irrevocably vanished, impossible to reproduce. Maybe that’s okay — change is a part of life, and pining for interaction with others in the form of an RPG that’s kiddie-pool level compared to dozens of free-to-play games is sort of silly. But when I thought about it in the context of current free-to-play games, like World of Tanks, Maplestory, and especially less popular games such as Uncharted Waters Online, there are some experiences that will, in turn, be lost forever in a sense. This is one reason why I prefer games to have an offline mode of some kind, or a design that won’t make a single-player version of it totally pointless. I’ve heard Guild Wars does this well, and presumably. when it finally kicks the bucket, Diablo 3 will handle it gracefully. Another interesting facet is that there is an admittedly small sub-genre of RPG that mimics online games, most famously the .hack series. I can “log onto” that and find a dozen or so “other players” to have a good time with — in fact, that service will stick around forever, effectively. It’s not quite the same as interacting with real people, but it arguably solves real-people problems such as excessive public chat, dancing in the streets of Stormwind, totally stupid players, and so on. While .hack doesn’t feel like an MMO, in another few years games could reach the uncanny valley where I’m not sure if I’m interacting with a player or a bot. I wonder if eventually, the remedy for dead and dying MMOs could be a “single player mode” which contains dozens of AI-guided characters playing alongside you? The thought is simultaneously fascinating and chilling — if it were possible to get the AIs to the point where they could interact with people well enough, it could have all the benefits of MMO and few of the downsides. I may not have mentioned it here, but I played Monster Hunter Tri on Wii off and on for a little over 100 hours. I’d been planning on buying a Wii U eventually in any case, since Monolith announced “X” and Xenoblade was among my favorite console games this generation. When MH3 Ultimate was announced, I knew I was going to buy the console earlier than expected. MH3 Ultimate is a sort of a reboot / remake of MH Tri. The early-game has been groomed and reworked so that it is much easier to get going, with many redundant or silly quests removed and some starting equipment provided at the start. “High-rank” quests, or quests with variants of monsters and more difficult move-sets, have been added to single-player. Further, there are now two companions that can join you in SP (rather than just one in the original). Some armor stats have been shuffled around to mix things up for veteran Tri players. The appeal of Monster Hunter is more about the learning process and player execution than about pure action. Mistakes can be made, or random elements can cause substantial pain to a hunter, but at no point is the pure reflex of, say, Castlevania or Ninja Gaiden required. Preparedness is key, and in multiplayer it is essential to cooperate to some degree with your compatriots – while all four hunters could use a hammer, and it might even be appropriate for some battles, it’s much better to have a variety of equipment and to have each hunter focus on something separate, while all keep an eye out for certain situations anyone can handle. When it is about to use its horn, its pouch will fill up and it will dance around. If you hit its pouch or throw a sonic bomb, it will fail and stumble for several seconds. Its wings are more durable than other parts of its body. Depending on your weapon, it is most likely best to hit its face or rear. If you can hit its wings, you can break the Quropeco’s flints. This yields additional quest rewards. With sufficient focus, you can also break its beak. When Quropeco gets tired, it will often fly to a nest at the peak of the area and go to sleep. With a charging weapon, it’s easy to give it a rude awakening. If Quropeco calls another monster, you can use a dung bomb to convince it to leave. If it calls a brown drake, dung bomb and get out. If it changes up the rhythm with which it knocks its flints together, that means it’s about to hit three times instead of two. While it’s flying, you can hit it for a bunch of damage or blind it using a flash bomb to bring it back down to the ground. This might sound intimidating, but there are many patterns between monsters that make things easier, and much of the game early on will be learning small tricks – how to use bombs, how to trap monsters, what moves are most effective when hitting certain body parts, and so on. Once that is learned, you can at least be a productive member of a team online, and the online community for MH3 Ultimate has been pretty good in my brief experience. Just as important as the learning process is the payoff. The best way I can put it is that playing Monster Hunter online in a well-oiled team is the closest thing to having a great team for a sport or a project at work. MH3 may well be the best multi-player game I’ve played simply because it encourages and rewards the proper kinds of coordination – breaking off parts of a monster, using a flash bomb or a trap at exactly the right moment, dung-bombing a monster that has another player pinned, and so on are reminiscent of games like Left 4 Dead, but don’t feel quite as contrived. At the same time, it feels almost like a personal sort of growth takes place as well. You as a player are consistently improving for at least the first 40+ hours, whether it’s in terms of game mechanics or in terms of game statistics. Much like Dark Souls, half of the ‘leveling’ is done by the player and subsequent play-throughs are much quicker and done with more confidence. While I can’t recommend this game for some, as they don’t have the kind of time to sink into this game (the first 5+ hours aren’t especially rewarding), if you do have that time I would recommend giving it a try for sure. MH3U is also on 3DS, although on that system it only has local multi-player which makes the experience considerably less engaging.